When you need to connect more than one display from a single source device, a HDMI Splitter is the perfect solution. These HDMI Splitters will accept the input signal, which is then duplicated via each output (identical to the original). As these units also feature a signal amplifier, this will ensure absolutely no loss of quality and the longest transmission distance possible. Not sure of the difference between a HDMI Splitter and Switch? Our HDMI Switch vs HDMI Splitter guide explains. This 2 Way HDMI Splitter will split the signal from a single source device to two displays. Features a bandwidth of 340MHz to enable support for Ultra HD 4K resolution. Also supports 1080p, 3D, HD audio and more. Splits the HDMI signal to 2 displays with no quality loss. 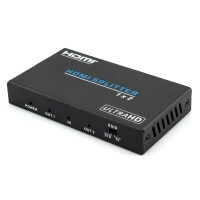 This 4 Way HDMI Splitter will duplicate and amplify the signal on all four outputs. Features extreme bandwidth of 340MHz to provide support for stunning Ultra HD 4K resolution. This device is the perfect solution to connect up to 4 displays from a single source device. 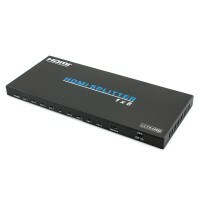 If require the connection of up to eight displays from a single source device, this 8 Way HDMI Splitter is the perfect choice. The ultra high 340MHz bandwidth and integrated signal amplifier will ensure premium performance from all 8 outputs. Supports 4K, 1080p, 3D and more. This high performance 16 Way HDMI Splitter will facilitate connection of up to sixteen displays from a single source device. The integrated signal amplifier and ultra high 340MHz bandwith will ensure flawless performance from all 16 outputs. Supports 4K, 1080p, 3D and more. This premium 2 Way HDMI Splitter will split the signal from a single source device to facilitate simultaneous connection to two displays. This device features the latest HDMI version 2.0 technology to support 4K Ultra HD (60Hz), HDR, 1080p, 3D video formats and more. 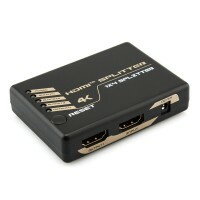 This premium 4 Way HDMI Splitter will split the signal from a single source device to facilitate simultaneous connection to four displays. This device features cutting edge technology to support ultra high definition resolutions up to 4K at 60Hz, HDR and more. This high performance device features the latest HDMI v2.0 technology to support ultra high definition resolutions up to 4K at 60Hz, HDR (High Dynamic Range) and more. This 8 Way HDMI Splitter facilitates simultaneous connection to 8 displays from a single source device. This exceptional distribution device allows up to sixteen displays to be connected simultaneously from a single source device. This 16 Way HDMI Splitter is built with the latest HDMI version 2.0 technology to support ultra high definition resolutions up to 4K at 60Hz. This exceptional device will extend a HDMI signal up to 50m, while at the same time supporting simultaneous connection to a local display via the HDMI loop out. The wideband infrared repeater (Foxtel compatible) provides IR pass through back to the source device.